Joyjit Deb Roy, Winrock's senior vice president of programs (front row, black t-shirt) and USAID’s Kipp Sutton (back row, black t-shirt), with Tech4Farmers Asia Challenge 2.0 winners. A low-cost aquaponics operation in Nepal. A mobile app that helps farmers work together to share equipment and manage their incomes. These are just two of the new ideas pitched at the Tech4Farmers Asia Challenge 2.0 in Bangkok this fall. The event, organized by USAID and Winrock International, brought together some of South and Southeast Asia’s most promising ag tech startups, vying to win support that would help them improve the adoption of their products in home and regional markets and respond to the looming threat of food insecurity and growing poverty. “The food challenge affects everyone, whether it be American businesses seeking sustainable supply chains or rural Asian households striving to earn a meaningful income,” said William Sparks, project director of the USAID Feed the Future Asia Innovative Farmers (AIFA) Project. “We are transforming the lives of farmers by establishing a mechanism to discover, develop and disseminate innovations from these bright entrepreneurs that are then incorporated into agricultural market systems throughout the region.” And in fact, AIFA has sourced 91 agricultural technologies and innovative practices, transforming the lives of 16,500 farmers. AIFA has engaged more than 130,600 people in 10 countries since the project began in 2015. 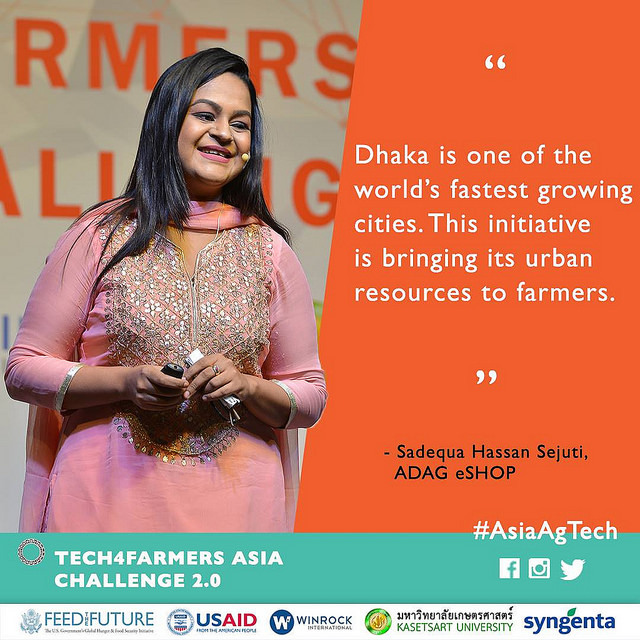 AgTech entrepreneurs that competed at the event came from across the region, including Australia, Bangladesh, Cambodia, Nepal, Vietnam and Thailand. The eight winners included a Nepalese social enterprise providing year-round solar energy for farmers, a Bangladesh social business IT company developing digital soil testing kits that deliver precision soil analyses and Vietnam-based entrepreneurs introducing protein-rich insect fishmeal as an alternative to soybean fishmeal. The summit brought together social entrepreneurs, investors, government officials and food security experts, giving them all the opportunity to learn about the latest innovations revolutionizing agriculture and to connect with a diverse regional community of likeminded people. “Sometimes it’s just about meeting that person or that investor who comes to your pitch. 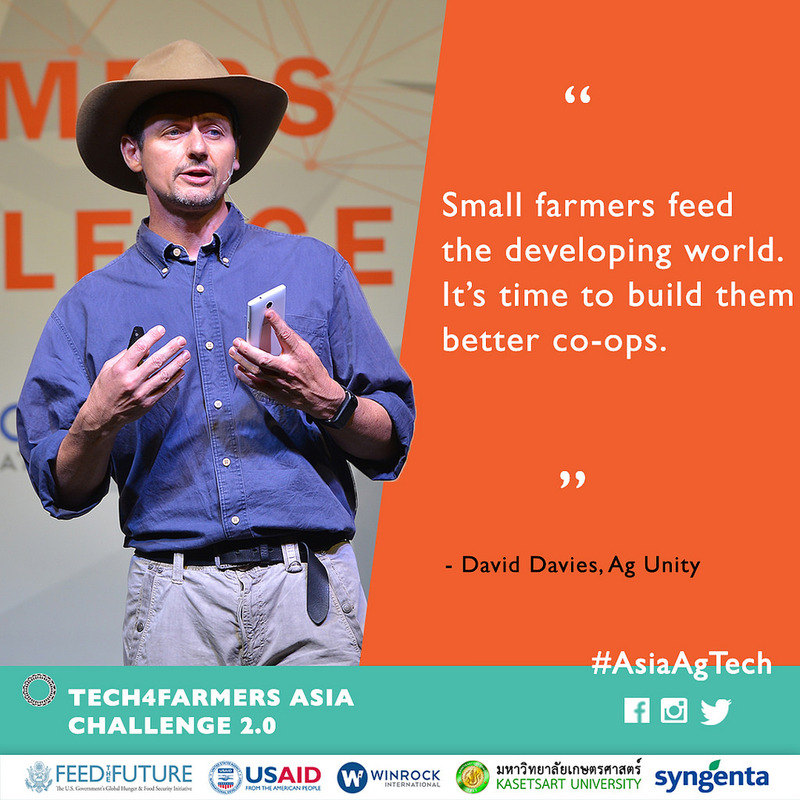 It’s the difference between taking a few years and not going anywhere or taking six months and you’re skyrocketing ahead,” said Angus Keck from AgUnity, one of the Tech4Farmers Asia Challenge 2.0 winners. The winning entrepreneurs received cost-free product testing led by Kasetsart (Thailand) University’s R&D team as well as project-supported business services and end-market analysis to help them grow the market for their innovations. In addition to the live competition, panelists at the event discussed avenues to increase access to markets and opportunities for investment in agriculture value chains. 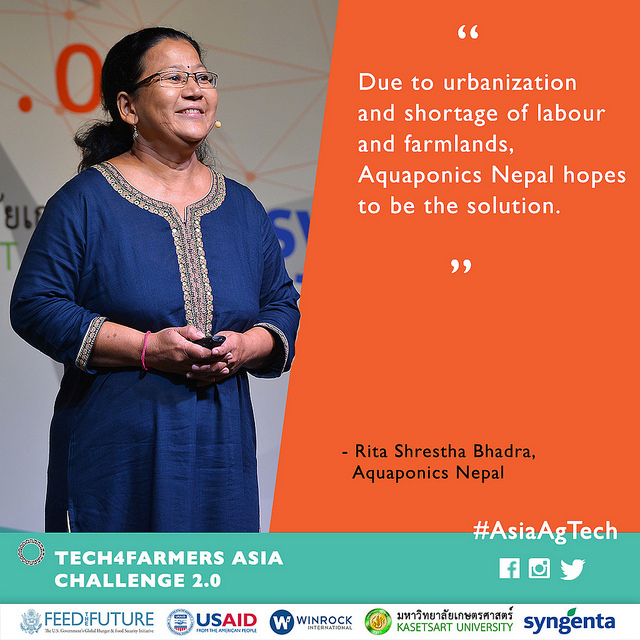 The event hashtag #AsiaAgTech generated over two million impressions in just one week, confirming that the topic of addressing food challenges through innovations is at the heart of discussions on international agricultural development.